Take off your shoes … let your feet breathe … feel it … be careful … enjoy! 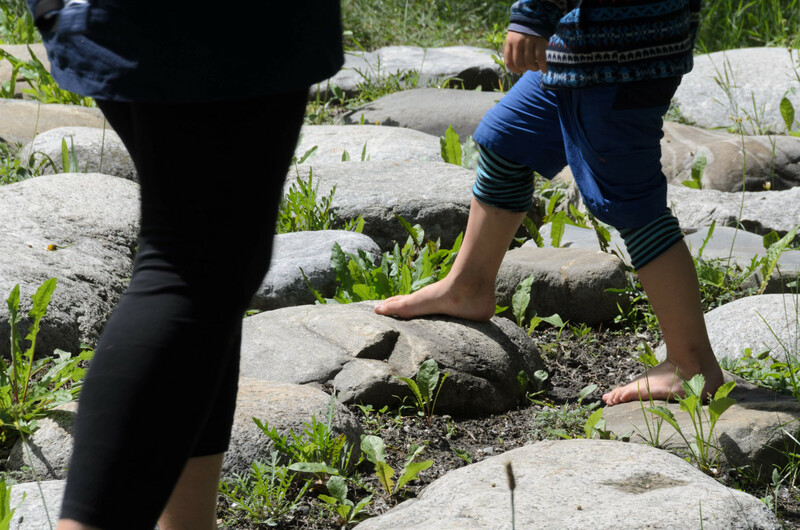 The first contact with barefoot was when we had to decide what shoes to get for our child who starts with the first steps. We liked the idea that the foot is naturally perfect and if it’s free it works correctly (as opposite to feet kept in the “right” position in the orthopedic shoes). But to not be “the pot calling the kettle black” we also had to try it. At the beginning we were not even considering to get rid of shoes (now I don’t even know why), so we started with minimalist shoes. The first excitement from the shoes’ flexibility, toe space and freedom of movement was replaced by tiredness and pain in heels and hips. Now I know it was because of our approach – we changed the shoes but didn’t change the style of walking. But then we took a walking course where we were taught to walk consciously and how to walk in minimalist shoes or without shoes. Later I was further studying various papers and other available materials. I was on a research trip in Italy, Austria and Germany, consulted the barefoot walking in exterior and interior with trainers, coaches, physiatrist and physiotherapists, neurologist, designer of fivefinges shoes and talked with many pro- and anti-barefoot oriented people. During this period I’ve been walking in minimalist shoes. I was consciously trying to walk correctly but when I was in hurry or not paying attention I moved back to the gait with hard heel strikes. This didn’t happen when I was really barefoot outside. The direct stimulation from ground didn’t allow me to strike the surface so hard and my feet naturally adapted to various obstacles. That amount of information from feet flooding in to my brain was pushing any other thoughts away and I was forced to concentrate to present and conscious walking. Suddenly I was able to walk correctly. So I was taking my shoes off more and more often. At the beginning I still had some sandals with me, just in case … but I didn’t need them … at the main square in Banska Bystrica, on the streets of Bratislava city, in Venice. During the whole season I didn’t step on a glass, I didn’t cut my feet, didn’t have any injury. 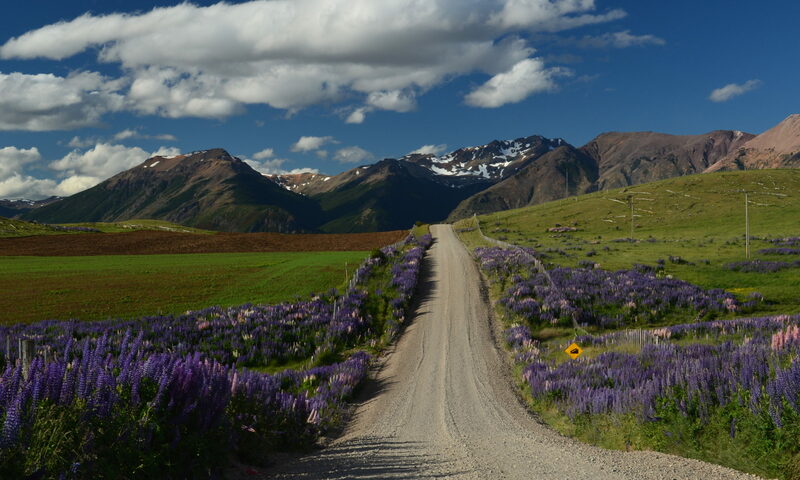 Two times I was stung by a bee and couple times I stumbled – but nothing more serious. I was able to control and feel the car better while driving. Simply I discovered new sense which completes the information about my surrounding and naturally corrects my gait. 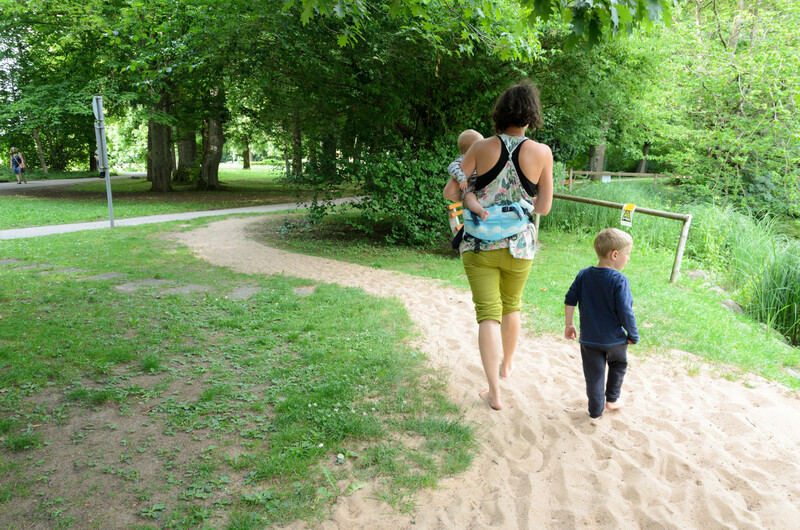 It’s very important to support barefoot walking and select right shoes for children – they cannot really take decisions by themselves and they accept also fixing their feet in something uncomfortable and small. The children’s feet can be shaped and formed until 8 years of age. Using improper shoes can later lead to health problems not only with feet but also with back or general body posture. Next time you’ll see a child who wants to take off shoes, don’t stop him and let him to train the muscles and to enjoy the information which will fill his head. People stare at me and children point fingers at me but I don’t care. I use me feet the way they evolved. I don’t have problems with lower back pain, I corrected my posture and my body has to absorb much less shocks from heel strikes. I’m slowly adapting to this new movement style and processing all the interesting information coming from my feet. Maybe I’ll be able to walk barefoot even in colder season but now I’m already wearing shoes. My (minimalist) shoes fulfill all the requirements to let the feet work correctly – but still it’s a huge difference than to be really barefoot. Those 3mm of sole allow me to ignore the natural stimulation from the ground and tend to return to the old “shoe” walking style. I don’t disapprove shoes – there are many reasons for them. But the normal shoes are mainly a fashion accessory not a tool to protect and help the feet. In many situations it’s better to wear shoes – on a construction site, in winter, on a hot pavement in summer, in heavily polluted areas, on sharp stones or plants with spikes… but these situations are not so common as you would think. Just listen to your body and your feet. And why do I try to put stimulation surfaces into interiors when there are so many outside? Most people wear shoes during the whole day and the home interior is the last ”barefoot paradise”. Unfortunately most of the interiors don’t contain any stimulation or obstacles on the floors and therefore the feet don’t have any reason to walk cautiously and softly. The result is that people stomp because they keep the shod gait style. Physiatrist recommend wearing slippers on flat and hard floors at home. 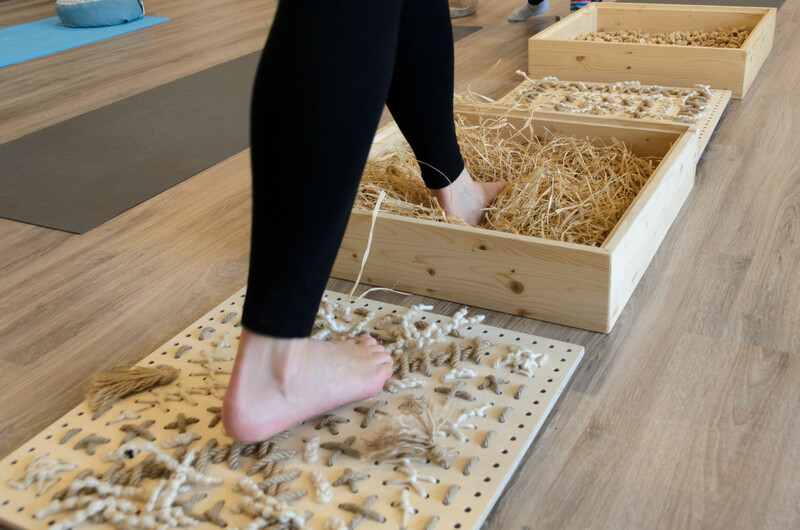 I understand these recommendations but I don’t agree with them – I think that better solution is to find interesting surfaces which enrich the interior and encourage the feet to train and move correctly.